Asha phones. They take you a long way, but yet make you always want more. In this case, more would mean something with Windows Phone inside. Looks like the right thing for Nokia to do - keep customers in the Lumia waiting room, and away from Android temptation. That said, the Ashas have been putting the smart in dumbphones for a while now, so a cheap droid isn't the only option that users shopping for a touch phone with apps, games and fast data can afford. The Nokia Asha 501 did well to demonstrate the platform's new look and feel, ticking some right boxes for a smartphone wannabe: touchscreen, Wi-Fi, fresh and reasonably fluid OS, and an app store. The Asha 502 and Asha 503 followed it up - the first one adding to the camera, while the one we are looking at now is the lineup's top spot, the 3G-enabled Asha 503. 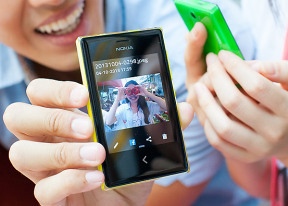 The Nokia Asha 503 is obviously the most feature-rich of the new Asha generation, with a Gorilla Glass-covered 3" QVGA capacitive display, a 5MP camera with LED flash, 3G and Wi-Fi connectivity, optional dual-SIM support, plus expandable memory and the latest Asha Software Platform v1.2. Sticking to a proven recipe, the new Asha 503 is available in six different flavors: yellow, black, green, red, blue and white. Nokia has those eye-catching paintjobs coated in an extra layer of icing, a nice and easy way to jazz up the looks. And it's a phone that looks fresh on the inside too - the swipe-driven UI with Fastlane, the ability to run a handful of popular apps and games, a proper app store, social services, good organizing skills and internet connectivity. It's a small handset with an even smaller screen and that won't be everyone's cup of tea. After all, screen real estate has only been getting cheaper. The resolution is nothing to write home about either, Ashas are at the very bottom of the food chain at QVGA. On a second thought, there're still droids launching with this kind of display resolution. On a positive note, the Asha 503's screen is covered with Gorilla Glass 2 and it is the first of its kind to offer Wi-Fi n connectivity, enabling faster data transfers. You obviously can't have everything and then demand the best of it for this kind of cash. The inevitable compromises aside, the Asha 503 is promising to keep you up-to-date, connected and entertained - and it'll give it a decent try. Now, is it enough or is that short step to entry-level smartphones worth it? Let's see. Our hardware checkup follows right after the break.